Attack of the 3 oz Travel Sizes! Air travel is a Beauty Editor’s bad dream (one of many; “Strip Mall Botox,” “Booty Shorts and Uggs,” “Unblended Foundation Line,” are just a few that haunt my thoughts.) Going to a different climate altogether proves a challenge. Although I grew up in New England, I’ve been an Angeleno for eight years now, and don’t need thick, heavy moisturizers in November like I would back home. For a quick packing primer, remember the 3-1-1- rule and head to your local beauty supply for travel size containers. Drugstores have them, too, but my favorite, Larchmont Beauty has a large selection and even little travel kits. They also have hairbrushes of all sizes. I put everything in a ziploc bag so I don’t get hassled at security. Be sure to label your containers! Security: The very first time I was asked to take off my shoes at an airport, I was wearing a pair of gorgeous leopard mules (whatever happened to those?) and the security guy just pointed, to which I naturally replied, “Thank you.” (It was early.) Lesson learned: never wear anything with laces. Do you want your luggage to go ahead of you in that little bucket or to be the object of ire by those behind or with you? Packing: everyone has their own style, but ziploc bags continue to be my staple. When I moved to London some years ago, a friend of mine told me, “Bring your own ziplocs!” She was right (and I did.) They are my indispensable beauty travel bag, and while I still have tons of makeup bags, nothing beats them. Comfort: I just found this brilliant little eyemask by Bucky. It claimed to block out all light and when I tried it on it really did! It comes with earplugs but I just bought an extra pair. I am cursed by noise wherever I go. I must have sold fireworks in a former life. I have a neck pillow and also a big pashmina thing. It’s better to be too warm than too cold. Airplanes are always cold. Your bag: I once flew 22 (yes) times in one year, so I know this rule well. Although my gypsying days are behind me, I can live out of a bag well. That year mine was called “The Tomato,” and it was a fabulous, durable red vinyl that I bought off Portabello Road. It was instantly recognizable if I ever had to check it (which I really try never to do) and easy to carry. If you don’t have a recognizable bag, get a recognizable tag. When I lived in New York, I frequented Flight 001 regularly and I didn’t even realize they had a store here! They are great. Your face: I used to slather my face with all kinds of products before I got on the plane, but this travel restriction really put a crimp on that. Now I have to do it before I leave the house. The best thing to seal all of your products in is a long-wearing overnight moisturizer like CeraVe. 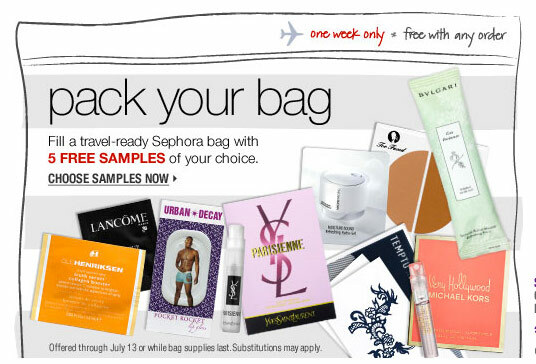 Traveling is also a great time to use up all of your samples. Creams, perfumes, masks-the “I’ll try this someday” gets used. Donna Lethal is the author of "Milk of Amnesia" and writes for her own blog (Lethal Dose), Hair Hall of Fame, Dowager Quarterly, Find A Death, & the Valhalla Cemetery chapter in "Weird Hollywood." 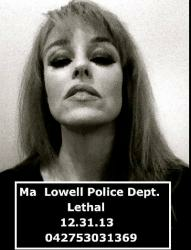 A native of Lowell, Mass., she's lived in Boston, NY and London before settling here. When not writing, she's hiking, soaking in a Korean salt room or in the high desert with her pit bull. This entry was posted in Miscellanious and tagged travel. Bookmark the permalink. 2 Responses to Attack of the 3 oz Travel Sizes! Wow! I needed these tips for this upcoming trip! Thank you! My friend used to remind me as I packed, “We’re not leaving the planet.” So I often stop off on the way to the hotel and pick up the common toiletries. Now some airports have Clinique dispensers! Saved my life on a recent trip to Atlanta.